Image Builders Marketing, Inc. would like to extend a special thank you to all of the business organizations and individuals who take an active and enthusiastic role in the Brecksville Community Guide & Chamber of Commerce Directory, especially our advertisers who provide the financial support to make this a successful community project. We hope that you enjoy the informative features contained in this publication and will keep it as a reference guide for community and advertiser information. No part of this publication may be reproduced by any means without the written permission of the publisher. Advertisements and listings in this publication are provided as a public service. Image Builders Marketing, Inc. is not responsible for errors or omissions, and inclusion does not constitute an endorsement or recommendation. AROUND AND ABOUT (top to bottom): Brecksville Parks are a large part of the City; the gazebo on the square; the bridge over Chippewa Creek on Route 82; the audience enjoys a concert during the annual Home Days event. MERRY-GO-ROUND BRECKSVILLE: Julie and Claire Link ride the carousel (above)at the annual Brecksville Home Days; Old Town Hall, also home to The Brecksville Theatre. 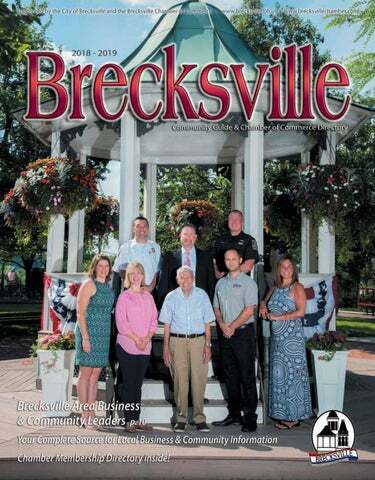 ON THE COVER: Brecksville Area business and community leaders, see page 10. COVER LOCATION: Brecksville Gazebo on the Square. PHOTOGRAPHER: Andrea Bartel, Beverly David Photography. IT'S HIS DAY: Brecksville resident, Bill Toneff proudly displays his City Proclamation (above); Mayor Hruby introduces Bill Toneff as the grand marshal of the 2018 Memorial Day parade (left). LAND OF THE FREE: Brigade of the American Revolution 5th Virginia Regiment firing their muskets at the Memorial Day celebration (opposite page); Flags of Honor evening display (above). “Our family was relieved that we could find a place, practically in our backyard, that could provide the mental, physical and emotional care that our Mom so desperately needed.” – S.F. Proudly Serving the Brecksville Community Since 2011 Why Saber? Saber Healthcare Group® is the best choice for clinical care because our focus is on the wellness of the whole patient. Saber’s team provides expert clinical care in a warm, caring, professional atmosphere that both patients and their families appreciate. Our focus is on delivering the highest levels of care consistently, every day. What this means for our patients and their families is peace of mind knowing that experienced, happy, compassionate people are taking care of them. We think that matters, and we believe you will too. Call us to schedule a tour today! "BEE THE DIFFERENCE": The graduating class of 2018 (above) earned more than $16 million in scholarships. Special thanks to the local organizations, who participated with more than $85,000 in awards and grants; Hilton Elementary Principal Chris Hartland (right) shows he is proud of his students by featuring a variety of incentives to encourage student achievement and positive behavior. Thank you Brecksville! Want to be in the next Image Book? One Family, one District… and one Mission. The mission of delivering a fine education. Continuously ranked as one of the Top Performing School Districts in the State of Ohio! Coding Professional and more. Cuyahoga Valley Career Center is really the place to “Find your Passion and Create your Future.” For more information please visit www.cvccworks.edu. Profiling some of Brecksvilleâ&#x20AC;&#x2122;s most recognizable faces FIRST ROW (left to right): Amy Mackie-Barr, Head of School, South Suburban Montessori; Dr. Jen Hechko, Owner, Brecksville Kids Dentistry; Bill Toneff, Brecksville Resident and World War II Veteran; Sean Sullivan, President, Brecksville Chamber of Commerce; Joelle Magyar, Superintendent, Brecksville-Broadview Heights City School District. SECOND ROW: Nikola Zamiska, Chief, Brecksville Fire Department; Peter Bergmann, President, UH Parma Medical Center; William Goodrich, Chief, Brecksville Police Department. Missing from Photo: Jerry Hruby, Mayor, City of Brecksville. Photo Location: Brecksville Gazebo on the Square. Photographer: Andrea Bartel, Beverly David Photography. South Suburban Montessori School provides an authentic Montessori education to children between 18 months and 14 years. “Our values of compassion, authenticity, respect and excellence inspire our school’s rich tradition of nurturing each child’s natural love of learning,” states Amy Mackie-Barr, South Suburban’s Head of School. Geography, world cultures, history, humanities and the arts, as well as the core subjects of science, mathematics, reading and writing, creates an intellectual environment that fosters empathetic, confident, courageous, self-learners. The Montessori curriculum at all levels is developed around the developmental needs of the child and is presented in the form of lessons as the child shows interest and readiness. Founded in 1970, South Suburban is located just 20 minutes from downtown Cleveland in Brecksville’s beautiful Blossom Hill Complex. designed to create a space for students to learn who they are, what they are capable of and how they can make a difference in their community and world. SSMS offers music, art, Spanish and unique collaborations with their Amy-Mackie-Barr, Head of School surrounding neighbors for swimming, skiing, tennis, golf, community service and adventure trips. South Suburban Montessori looks forward to sharing their school with you! If your child loves camping outdoors or plays with dogs, then Brecksville Kids Dentistry makes going to the dentist a fun adventure. A Bichon Maltese dog greets patients and does double duty as a “dental assistant.” Affectionately called Balto, this certified therapy dog comforts children by putting its chin on the patient’s lap or sitting in the dental chair. 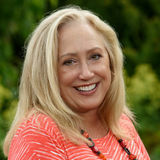 It’s all part of the caring, child-centric philosophy of Jennifer Bryk Hechko, DDS. Instead of a clinical feel, there is a log cabin mural in the reception area and a tree-dense forest leading to treatment rooms. placed over the teeth to cover the yellow spots. I partner with parents to determine the best treatment and encourage them to be an active part in their child’s dental health.” A mother of three young children, Dr. Jen graduated from The Ohio State University College of Dentistry and worked in private practice for 14 years. “By creating a dental adventure, we instill in kids at an early age not to fear going to the dentist,” says Dr. Jen. “We build a foundation of excellent oral health and create a ‘dental home’ where patients feel comfortable.” Here the “drill” is called the “water blaster,” and kids can hold the dental instruments as the staff explains how they work prior to the treatment. “It’s exciting to be part of the community and bring advanced dental care to children of all ages,” she says. “This tell-show-do approach educates children and makes them comfortable with dental procedures, and is appreciated by our patients and parents,” says Dr. Jen. Brecksville Kids Dentistry offers preventative checkups, cleanings, fluoride treatments, sealants, fillings, crowns, tooth extractions and custom mouth guards. They also offer nitrous oxide and sedation dentistry, as an anesthesiologist comes into the office monthly to provide IV sedation. For cases that require advanced medical care for medically compromised children and special needs adolescents, Dr. Jen belongs to Fairview Hospital and Medina Dental Surgery Center. She recommends that children see a dentist when their first tooth appears or by the age of one. “Preventive checkups are key to good oral health as dental decay is the No. 1 infectious disease,” says Dr. Jen. “I also am an advocate of cosmetic dentistry if it helps a child’s confidence. For patients with enamel hypoplasia, a whitening sealant is Dr. Jen is welcoming new patients! Health & Wellness Among the Best Hospitals for High-Quality Care University Hospitals Parma Medical Center began 2018 with the outstanding news that it earned the highestpossible quality rating from the Centers for Medicare & Medicaid Services, placing it in the Top 8 percent of more than 4,000 hospitals across the country for quality, safety and patient experience. This Five Star rating from CMS underscores the focus on compassionate care that is the hallmark of this cornerstone in our community for more than 50 years. Quality care begins in the field. Through UH’s EMS partnerships, the telestroke program that allows paramedics to livestream their stroke assessments to the Emergency Department has expedited care and given the hospital statewide and national recognition for innovative. UH also funded the inception of PulsePoint, a firstresponder app, for the Parma Regional Dispatch Center to save even more lives. 8736 Brecksville Road • Brecksville, Ohio (216) 581-2900 | www.jenningsohio.org Jennings is a Northeast Ohio non-profit organization sponsored by the Sisters of the Holy Spirit. allow consumers the ability to afford more. There have been several increases in interest rates this year but not drastically. The housing industry has been hit with numerous trade/ vendor price increases over the past 2 years which continue to make new home prices increase. Lumber, drywall and concrete are just some of the housing products that keep increasing. My suggestion to anyone waiting to buy a new home would be not to wait! Buy now and you will be able to save a ton of money on your new home purchase! For more information on building your new home, contact Parkview Homes at 440-846-3710 or visit them in Brecksville at The Preserve at Parkside, located just south of Snowville Road on Dewey Road, or visit www.parkviewhomes.com. themselves living there so let your house be the haven they fall in love with! Price your property correctly for your neighborhood and not what you would like to get. No matter what the market conditions are, a realistic price for your area will get your home sold in a reasonable time frame. Talk with a real estate agent that has experience in your area. The realtor will review recently sold properties, current listings and assist in establishing a price that will sell your home as quickly as the current market conditions will allow. It’s Not Your Father’s Assisted Living Assisted living is a program that promotes resident self-direction and participation in decisions that emphasize choice, dignity, privacy, individuality, independence and homelike surroundings. New communities focus on providing residents with the most independent lifestyle possible, with personalized nursing and care services to support that independence. The following list is provided to this publication by the Brecksville Chamber of Commerce. For questions or concerns, please call 440-526-7350. Nosek & Sons, Inc., A.
Weiler Legal Services, Co. L.P.A. Maple Crest Farm is a full-service riding, driving, training, and boarding facility. Brecksville Branch Library Brecksville Branch / 9089 Brecksville Road / 440.526.1102 Please check out our on-going book sale during library hours. Stop in and pick up an application today! Find daily deals in our ongoing sale area. 7305 Chippewa Rd. Opening Soon! Paula and Dennis Kancler place their son's flag at the Flags of Honor ceremony.